In a few weeks, we’re paying homage to our favorite chewy, crunchy, savory, hearty rice dish — paella! March 27 is National Paella Day in the United States, and we’re celebrating the famous Valencian dish by participating in a Paella Cook-Off for a good cause. On March 24th, Jimmy Carbone of NYC’s Jimmy’s 43 restaurant and bar will host the first NYC Paella Cook-Off. Professional and amateur chefs are invited to compete for prizes by serving up their signature paellas. Our friends at Iberian Beer United will provide Spanish craft beers that pair exceptionally well with meat, seafood and vegetarian paellas. For $20, you can attend the event and eat your way through a variety of rices presented by expert and amateur chefs from NYC. Professionals and food critics will help us to judge the best paella, and the public will cast their own vote for the coveted ‘People’s Choice Paella Award’. The best part? All proceeds collected from tickets and raffles will go to New York City Coalition Against Hunger to feed the hungry in the NY metro area. What does the Paella King or Queen win? That’s where we come in! 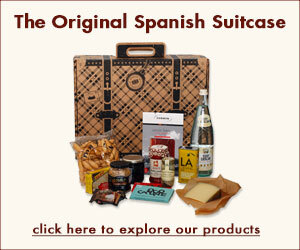 The top chef will win our “Chef Suitcase” gourmet gift basket. 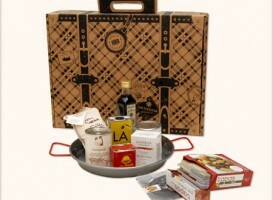 Packed in an eco-friendly, travel-inspired cardboard “suitcase,” this assortment has everything a chef needs to whip up a perfect paella — bomba rice, Tagornar extra virgin olive oil, saffron from chef María José San Román, recipe cards from chef José Andrés, Flor de Sal d’Es Trenc organic sea salt and more. - Runner-ups will receive a new paella pan from PaellaPans.com. Pans will also be available to purchase at a discount during the event. - Iberian Beer United will raffle off a basket of Spanish craft beers — only recently available in the US! Bomba Bomba Bomba, There’s More! Jimmy’s #43 will have a paella dinner on March 27th to honor the real National Paella Day. Want to cook or judge? Get involved by e-mailing Jessica@iberianbeerunited.com. This was a great time!